The materials that these D Rose basketball shoes are made of feel heavy on hand, but paradoxically feel light when worn. Plenty of purchasers agree that the shoe breaks in quickly and nicely. A good number of shoe owners praise the Boost in the Adidas D Rose 7. Wearers say that the shoe performs well on both indoor and outdoor courts. The padded inner walls of the shoe are appreciated by a lot of customers because they provide a good amount of ankle support. The outsole’s herringbone is praised by many users because it grips floors so well. For most buyers, these Adidas shoes look good not only on the court but also off it. According to a couple of testers, the torsional plate helps greatly with stability and support. The Adidas D Rose 7 is one of the best when it comes to flexibility, assert a reviewer. 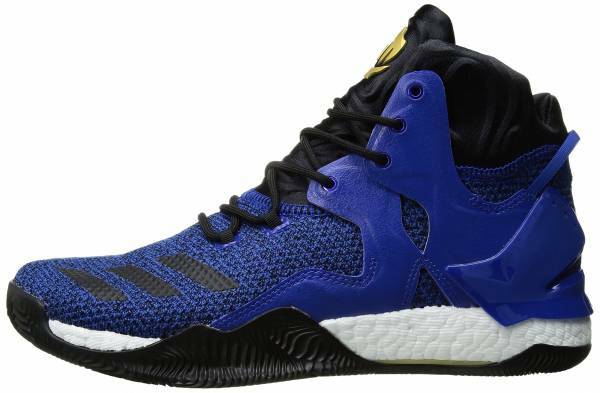 A few users say that these Adidas basketball shoes are heavy and bulky. A handful say that the Adidas D Rose 7 has bad ankle support because there is too much padding. According to some owners, the shoe runs a bit short and feels narrow at the forefoot. The Adidas D Rose 7 is comfortable and delivers amazing traction. The full-length Boost is a hands-down favorite of most users. The shoe model is a certified performer on any court. It is also not an aesthetic failure. For its $140 price tag, it performs incredibly well. Buyers are hoping that when future signature releases, specifically the D Rose 10, it will be as good as 7th model. The D Rose 7 is a higher cut CrazyLight Boost ’16 with better traction, something I didn’t even think was possible. I think it's a top tier shoe. Aside from the price; I think it's a very quality shoe. The D Rose 7 here is a beast at every aspect and is a versatile shoe that can be worn by guards to big men. I love the Curry 2 and it will continue to be used a lot but the Rose 7 does every just as well but with better cushioning. The Adidas D Rose 7 is the third signature shoe of Derrick Rose to have Boost technology in the midsole. It delivers impact protection like no other. The traction of the shoe features a herringbone pattern, letting the player do multidirectional footwork without slipping. High-top basketball shoes are said to provide more ankle support to hoopers. However, there are those who prefer low-top basketball sneakers because of the increased mobility that they afford. At the same price of $140, wearers may try the low-collared Boost-equipped Harden Vol 3. If mid-top shoes are an alternative, the Adidas Dame 5 is a great go. Cushion. The performance of the shoe comes from the Boost technology in the midsole. It is thick on the heel and thin on the forefoot. The benefit of this is a smooth heel-to-toe transition that does not compromise court feel. Though the shoe model is said to have full-length Boost, the part directly below the forefoot is firmer than the one in the heel. The benefit is to have more court feel and responsiveness. The Boost right under the heel is softer. The purpose is to deliver excellent impact protection and bounciness. Traction. The outsole of the Adidas D Rose 7 is made of solid rubber, and it features a full-length and multidirectional herringbone pattern. The spacing between the grooves helps prevent frequent wiping during gameplay. The rubber grooves are thin and pliable, which provides superb court grip both indoors and outdoors. There is a recessed area in the outsole that runs from the heel to the middle of the shoe. It aids the athlete by providing a better flex while keeping the rest of the outsole in good grip on the court. For guard positions, this design is an advantage for their quick moves and cuts during gameplay. Length and Width. The length and width of the shoe are patterned and scaled after Derrick Rose’s feet. Although it is claimed to be true to size, there are users who mention that the midfoot runs narrow. New buyers who are wide-footers are advised to go half a size up. As for users with flat feet, they are advised to replace the insole of the shoe for a more comfortable fit. Lockdown. For a secure lockdown, the shoe has a simple lace-up system with round laces. The desired fit can be achieved by adjusting the shoelaces. The padding in the inner parts of the shoe and tongue helps secure the ankle and provides comfort to it. The upper of the Adidas D Rose 7 is made of engineered mesh with fused overlays. The mesh provides ventilation to the feet, and it wicks away moisture. There is nylon underneath the mesh, providing durability to the upper. The molded collar of the shoe provides a great amount of ankle support. This type of collar is recommended for people who prefer to use ankle braces when playing hoops. The Adidas D Rose 7 is a mid-top shoe with a one-bootie construction. This type of design provides a good amount of ankle support, preventing ankle rolls or any injuries. It also comes in different colorways. The toe cap has the adidas logo and callout. The prominent three stripes are displayed in the forefoot area. To make known that this is Derrick Rose’s signature shoe, the tongue has his famous logo. As for the heel counter, it has a thin and dainty nylon pull tab. It also has Rose’s signature and an adidas callout and logo. In January 2017, the BHM version of the D Rose 7 was released. It specifically honors legendary professional tennis player Arthur Ashe. He is the first male American-African to win three Grand Slam titles. He used his popularity to shed light on civil rights issues in the USA. It is a white pair with black leather overlays from the midfoot to the rear. The eyelets, pull tab, and inner walls of the shoe comes in a multicolor patterns.